Klaipedos Konteineriu Terminalas (Klaipeda Container Terminal, or KKT) and Klaipedos Smelte are setting new container handling records this year, according to the business daily Verslo Zinios reported on Thursday writes LETA/BNS. KKT handled 257,600 TEUs between January and September, a rise of 19 % on the same time last year. Klaipedos Smelte saw TEU handling volumes for the nine months more than double to 279,400 units, from 129,200 a year ago. 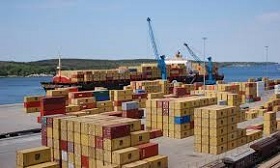 KKT CEO Vaidotas Sileika said the company was on its way to achieve a new annual record of over 350,000 TEUs in 2018, with the total cargo throughput of its terminals expected to reach 4.5 mln tons. KKT is investing over 8 mln euros in upgrading its cargo handling machinery in the next two years. Two new container lifters have been delivered to KKT recently and two modern cranes are to arrive by the end of the year, with another four cranes to be manufactured for the company next year.